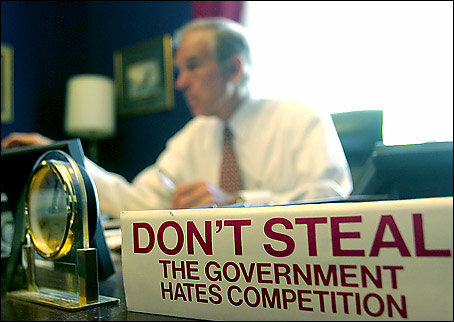 Peter Cresswell gives seven reasons why Ron Paul is not a libertarian. is appallingly “blame-America-first” on foreign policy. (1) Libertarians insist on the separation of church and state. If Ron Paul rejects the separation of church and state, he is not a libertarian. But what does separation of church and state entail? It comes down to freedom of religion (and freedom from religion, if you’re that way inclined). Ron Paul is not opposed to the separation of church and state. He’s opposed to the War on Religion. (2) Libertarianism is a view on how a government should treat its citizens. Its own citizens. Libertarians can be anti-immigration. Ron Paul believes that fetuses are Men, too. Thus, it is the role of government to secure one’s right to life both after and before birth. Abortion is not a moral issue. It is a metaphysical issue. Libertarians can be anti-abortion. (4) So Ron Paul “plays footsie” with racists, 9/11 Truthers and Objectivists. What of it? Libertarians insist on the right to freedom of association. Ron Paul exercises that right. (5) Pork barrel politics is anathema to libertarianism. Or is it? Ron Paul’s argument for pork barrel projects in his own district is that, “if they take it, we should ask for it back.” Seems reasonable to me. (7) Foreigners in foreign places tend to resent American government intervention in their lives, in much the same way that U.S. libertarians resent American government intervention in their lives. It is not unlibertarian to point this out. Blowback? If it’s America’s fault then blame America. Of seven purported reasons why Ron Paul is not a libertarian, none is any good. He argues for and gets earmarks for his congressional district – pork barrel politics. He then votes against the bill that gives the earmarks to his district – but he feels that he has to get that money allocated to his district, otherwise his constituents are unfairly punished by being denied their own tax money because they vote for a responsible politician. And obviously, if everyone voted and thought the same way he did there would be no pork barrel politics. It is an unfortunately nuanced position that is hard to articulate in a soundbite.